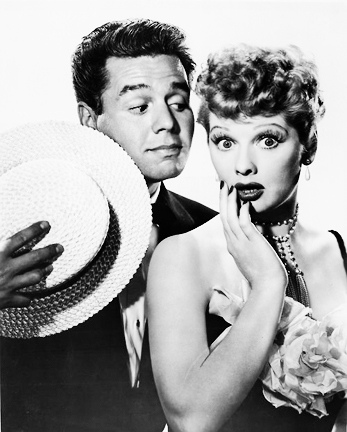 My Favorite Husband, I Love Lucy and … Us. 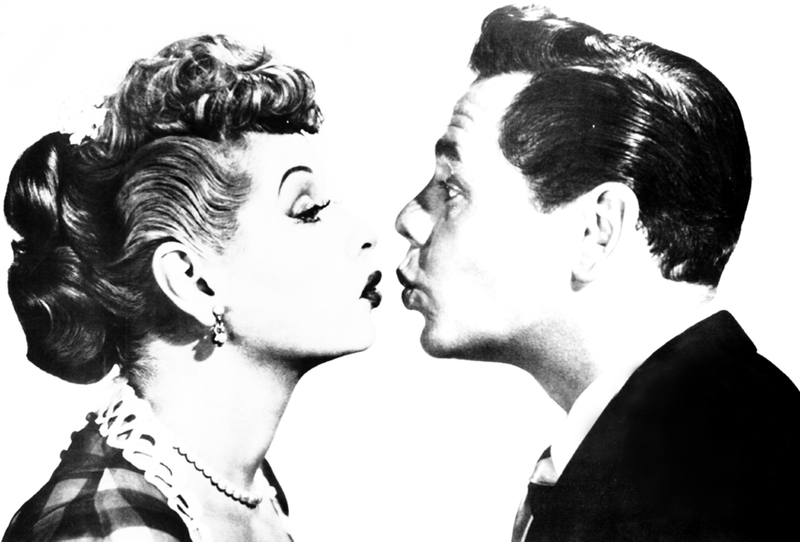 The Pictorial loves Lucy, and so does True Classics: the venerable classic film blog has dedicated today, Lucille Ball’s centennial, to a Blogathon named in her honor. I Love Lucy was born on a hot Saturday afternoon in August, 1948. It would be three years until the title and faces would become familiar, but the genesis had its birth at that precise moment: when comedy radio writer Jess Oppenheimer received a phone call from CBS asking him to substitute …. for their new radio program My Favorite Husband. Lucille Ball had been a Hollywood player since the late ‘30s … but had yet to become a formidable star. Shining in Stage Door and DuBarry Was a Lady, Ball still fell short of top-billing supremacy. By the late ‘40s, she had become bored of her prospects in film and made the decision to go on a national stage tour adaptation of Dream Girl— something that cemented the fact Ball was happiest when performing in front of a live audience. To prove her point, Ball took on a weekly radio sitcom at CBS: My Favorite Husband. Co-starring Richard Denning as her long-suffering spouse, it ran for three successful years (1948 -51). It was here that Ball began to fashion the character that would become the her career’s crowning achievement: Mrs. Lucy Ricardo. Oppenheimer eventually changed the surname “Cougat” to the more everyday “Cooper” and got Ball to openly embrace her natural gift for live improv. “I want you to go to school,’ I told her. It did the trick. When Lucy came in for the next rehearsal, I could see she was excited. Jack Benny would, one day, return the compliment: After I Love Lucy had hit the small-screen and was America’s reigning show on TV, Benny required all of his writers “go to school” by attending a live taping of I Love Lucy. CBS threw a fit. An interracial marriage on television? 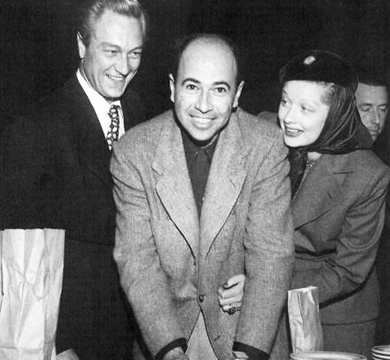 Who would believe, argued the suits, that an All-American redhead glamour-puss would be married to a third-world bandleader? She told the studio that if they wouldn’t let her do a show with Desi, she’d go on the road with him. So, in March 1950, the couple formed the soon-to-be famous Desilu Productions, created a Vaudeville act and took it across country.They were a smashing success. But it took the interest of rival network NBC to get CBS to swallow their pride, put the Cuban under contract. My Favorite Husband’s television second-life may have been a reality on CBS letterhead, but quite a few months of creative pow-wowing were still ahead. By Desi’s 34th birthday, March 2 1950, the Oppenheimer had solved his problem. Desi became Ricky: the every-man working class Cuban bandleader. And he loved his fiery redhead wife Lucy. It would give him a first class billing, as the titular possessive I, while still giving Ball top billing as Lucy: I Love Lucy debuted on American television March, 1951. And here we are, 60 years later, still feeling the show’s seismic influence. Great Lucy primer, Kitty. Found Oppenheimer’s memories and observations very interesting. 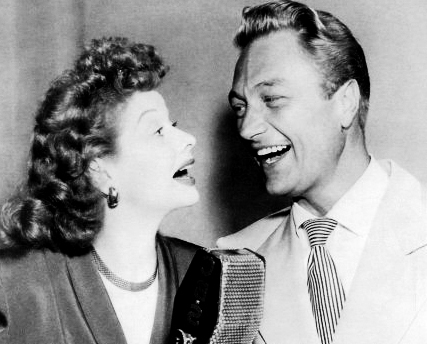 I have to wonder if Richard Denning had regrets (that Lucy insisted on Desi) once “I Love Lucy” became a runaway TV success. I wouldn’t worry too much about Richard Denning. He seems to have had a good enough career (one can’t say great in comparison to Lucy’s) in film and TV with continuous work throughout the 50’s and 60’s. I remember him from repeats of the b&w series “Mr. and Mrs. North” on TV. He made enough money to retire to Hawaii, and then was called out of retirement to play the Governor for over 60 episodes of “Hawaii 5-0”. Wonderfully written overview of a time and the people who changed the course of television. A great look at Lucy’s progression from radio to TV. Thanks for the look at Lucy’s early career! I love that story about Jack Benny’s team and Lucy trading off “going to school.” What a wonderful, one of a kind place to learn! Great post. You continually amaze me. Thank you so much for participating in the blogathon (and for your effusive praise–you truly flatter us!). I really enjoyed your look at My Favorite Husband. Jess Oppenheimer was truly a great producer and writer, and it’s so great to see you giving him the credit he justly deserves–after all, Lucy herself gave much of the credit for her television success to her talented team of writers. Wonderful blog or as Lucy would say “Wondahful.” Loved the quotes from “My Favorite Husband” and the Jack Benny story. As always, your blog is a treat to read!! !